Those who know me well are aware of the fact that I love photography. Many of my students have given me the nickname “El Paparazzi,” since I’m often found with one (or more) of my faithful Nikon cameras hanging from my neck. I love shooting candid, spontaneous images that in one way or another capture the essence of a special moment. One of my favorite images taken during an ISUM seminar in Argentina a couple of years ago leads me to the topic of my thoughts for this blog. 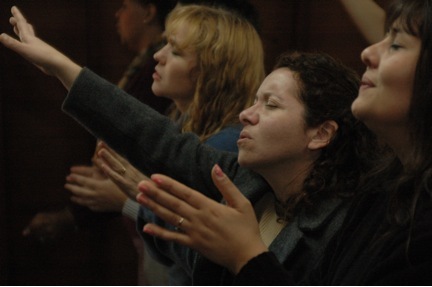 In the photo, three Argentine ladies are caught up in a beautiful moment of worship during one of the daily chapel services. For me, beyond its beauty and symmetry, this image expresses very well what ministerial training should be all about… leading people into a deeper knowledge of God and His word, and consequently into a closer walk with Him. Ministerial formation is not just about sharing information and developing skillsets, important as those things are. It’s ultimately about helping people strengthen their relationship with God, so they can help others do the same. 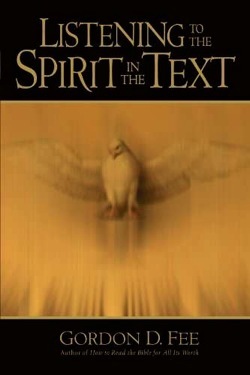 In his remarkable book, Listening to the Spirit in the Text, Gordon Fee declares, “Any theology that does not lead to doxology is nothing more than human philosophy.” He speaks about times spent in his office surrendered in worship to God under the overwhelming annointing of the Holy Spirit while exegeting the text of Paul’s epistle to the Philippians for a new commentary he was writing. The essence of Fee’s argument is that the best hermeneutic is indeed a Pentecostal hermeneutic. Recognizing that the inspired prophets and apostles wrote the Scriptures in the midst of powerful encounters with God, it stands to reason that a correct exegesis of the text must also lead to a powerful encounter with God, through the Holy Spirit. I realize that I’m “preaching to the choir” here, but let it be said that this same spiritual dynamic is needed in the classroom as well. 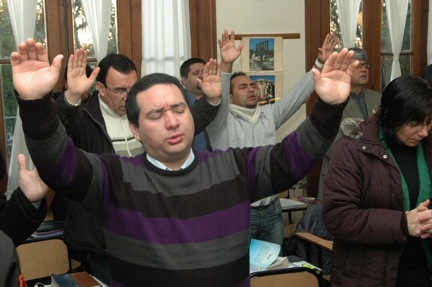 I’m not talking about trashing our course syllabi and making every class session a church service, of course. The point is, Biblical and theological instruction should be carried out with the objective of leading students into real encounters with God in His word. Our syllabi might be more effective if we allow time and space within them for such moments. Worship, therefore, is not something we do to “wake Him up” or “make Him come down,” but rather the believer’s response to what God has said and done. Reflecting on this, I have come to believe that we often arrange Word and worship in the opposite order of what is really needed. At the Centro de Estudios Teológicos in Santiago, this year we have implemented a change in how we use our chapel time. Instead of beginning with the usual fifteen to twenty minutes of singing choruses in a sort of random order, following that with a message from the Word which is often cut short by a clanging bell telling us it’s time to go to class (don’t you just hate that? ), we now begin by going immediately to the Word and leave the balance of our time for whatever response in worship, praise or intercession may be most appropriate. The message just received gives our worship more specific focus, direction and purpose. This reversal of the usual order has blessed us with many tremendous moments with the teachers praying at length with the students, without impacting our class schedule. We are doing the same thing at our local church, with wonderful results. Our people arrive earlier, and love the way this is working. Let us work to find ways to allow worship to be the natural outflow of our teaching, so that our lives and the lives of our students are enriched even more, with powerful encounters with God in His Word. A great word–and vivid photos, Jim! I enjoyed and agree with the thoughts on the “reverse order”. I will be teaching Church Planting here in Tijuana for the next term, along with my crusades. I am very thankful for the days we got to spend in Central America together. Blessings, friend! Thanks Jim! The tendency today is to dedicate more and more time to praise and worship and less time to the Word. I like the measure that you have taken because it allows believers to experience the Word of God with a more focused and Spirit-endowed response. Nothing wrong with changing our liturgy for a fresh encounter with the Lord. Great “stuff”, Jim. I’ve thought for quite some time that changing the order of service would be a great plus in our churches and gatherings. I believe it will produce greater and more fruitful koinonia. Growing up in a non-Christian home, the glorious times of repentance, intercession and worship during the altar service were a refuge of renewal, a safe place for me as a child and teenager. In those days time seemed irrelevant, and I would leave the morning service altar time beyond dinnertimer and in the evening service sometimes past 11:00 p.m. [Fortunately those who provided transportation for me before I could drive, were also patient]. That was church. In our educational venues we must have structure, but Jim, your article is right on. Since we have structure we must find ways to minimize the invasion of structure on what counts the most–intimacy with the Lord. Sometimes His Sovereignty will even invade the structure beyond what we would ordinarily consider “wisdom”. You emphasis on integrating word and worship in the classroom is vital. There is a growing academic tendency to relegate worship to the chapel, in favor of cerebral concerns. But classrooms void of worship and a profound sense of the presence of God, produce pastors who can preach without passion, live without prayer, and minister in a matter-of-fact way without the anointing. Right on! One of the critical aspects of servant-leader training is that she or he know how to abide in the presence of God and lead others in worship. Knowledge without devotion, theology devoid of devotion will only cause dissonance for the teacher or preacher. Connecting with God and with the people is at the heart of ministry. By the way, I hear very good comments about your preaching after or before the worship time.